So here's recipe # 1 of what we made during our cooking session at Oster Kitchen Conversations with Patty Laurel-Filart and Sinfully Sabrina. It's a very refreshing drink called Calamani-Basil Slush. It has all the makings of a mojito minus the alcohol so it's great for kids too! Make the basil syrup. Combine the sugar and 2 cups of water in a small saucepan and bring to a gentle simmer over low heat to dissolve sugar. Once the sugar is completely dissolved add a handful of basil leaves, remove from heat to cool. After 5 minutes, remove basil leaves and let the syrup cool. Refrigerate. 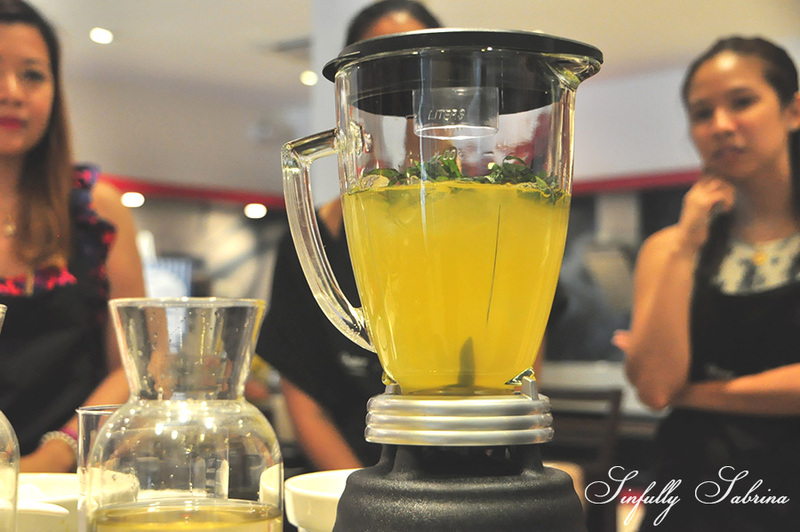 Blend ice, 2 cups basil syrup, 2 cups water and 1 cup calamansi juice.